The muses have blessed Uncyclopedia with an audio version of this article, for those who are into that sort of thing. Mah Nà Mah Nà is a song. Now go to another page. Quickly. Try this one. It's good. Or, if it's not, at least it doesn't involve Mah Nà Mah Nà...doo doo doo-doo doo, repeated ad insanitanum. 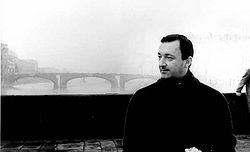 Piero Umiliani, foreground, shown in front of a bridge, background. At this time Piero was not yet made of felt, nor had he met The Snowths. Picture 1968: stoners, hippies, drugs, free love, the kind of love that you have to pay for, and hippies. Deep in darkest parts unknown a Volkwagen van driven by a musician, one Piero Umiliani, breaks down. Piero, trapped alone in darkest parts unknown with a broken VW van, previously mentioned, sits and listens to the wind. The wind says nothing. Piero isn't that stoned. He is only partly stoned, with a 20% chance of musical inspiration, rising to 100% after sunset. He starts a fire to warm his cold parts. Piero's unspecified parts need warming because being deep in darkest parts unknown has the unfortunate tendency to coldify the parts, unspecified, of musicians trapped alone in darkest parts unknown with broken VW vans, especially after the sun sets, as normally happens around sunset every day as the sun sets at sunset. Only one broken VW van, previously mentioned, was previously mentioned. The story behind the other broken VW vans is another story entirely. The sun, as happens daily in darkest parts unknown, had setted. Set. Whatever. Darkest parts unknown is (are?) even darker after sunset. Cold, too. Hence the coldening of parts, unspecified, that earlier in this story, were warm. This leads to a fire, set by Piero, who has cold parts, unspecified, that were unwarmed from their earlier warm state by the cold darkness of darkest parts unknown. Fire is known for its warmening properties. This makes it good for cooking s'mores. Piero, unfortunately, has neither premade s'mores nor the ingredients to make them on the spot in darkest parts unknown, whether or not he had a broken VW van, previously mentioned. In fact, he so thoroughly lacks s'mores-making materials that he would, no doubt, be unable to post-make them, at some undefined period in the future. Piero uses his guitar to kindle in the fire, which is harder than it sounds, as he has a steel guitar. Steel guitars are made from steel. Steel doesn't burn all that well, generally. Never the less, for the purposes of this story the steel guitar makes a fine fire, lighting up the darkened darkness of darkest parts unknown with its flamey burning and, with its burning strings, six times twanging away the silence that is endemic to the darkened darkness of parts unknown. He stares into the fire, watching the flamey flames burn their firey way up into the dark sky of darkest parts unknown, beside his broken VW van, previously mentioned. The fire, unlike the wind, has more to say than nothing. It says "Snap! ", excitedly. Later, it says "Crackle!". It says "Pop!" after that, just before lawyers in the employ of the Kellogg's™ corporation step out from the gloomy darkness of darkest parts unknown to demand payment for the unauthorized use of the trademarked™ trademark™ for Rice Krispies®. Rice Krispies® is also trademarked™, but this minor detail is not germane to this story. If it was a point, rather than a detail, it would be moot. They, the lawyers, take the broken VW van, previously mentioned, in payment for the trademark™ breakage. They do not, however, give Piero a lift, as he only owns two things that could be used as payment; the guitar, now burning, and the broken VW van, previously mentioned, which he no longer owns, making an earlier part of this sentence somewhat inaccurate. Piero on the Ed Sullivan Show in 1971, freaking out with his space-cows, The Snowths. Notice how Mah Nà Mah Nà has turned his formerly fleshy features into felt. Piero, now vanless of the broken VW van, previously mentioned, continues to stare into the firey fire of the flamey flames. Also, the flamey flames of the firey fire. He isn't picky. Picky is for people who aren't stranded in the fire-lightened darkened darkness of darkest parts unknown. Time passes, and Piero runs out into the darkened darkness of darkest parts unknown to take a leak. Then, frightened by the darkened darkness of darkest parts unknown, he comes back. The fire is still there, though it is no longer able to twang away the silence, as it ran out of such noises when the steel guitar that kindles it ran out of strings. Gone, too, is its ability to emit other, trademarked™, forms of onomatopoeia. The broken VW van, previously mentioned, continues to no longer be there; its lack of being there forms a broken VW van-shaped gap at the edge of the fire-lightened darkened darkness of darkest parts unknown. The fire, feeling guilty in an anthropomorphic way, throws Piero, his cold parts now warmed, if a bit frightened by their collective foray out into the darkened darkness of darkest parts unknown, a bone. The bone is the "hook" to a song. The song is untitled. 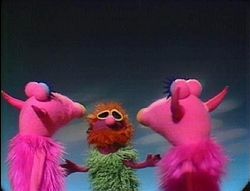 The hook is "Mah Nà Mah Nà...doo doo doo-doo doo". Though the meaning of these lyrics have never been revealed, since the song always involves one male and two female singers (of one species or another), it has been speculated that Mah Nà Mah Nà means Ménage à trois. The song, untitled, burrows its way into Piero's brain. The hook, Mah Nà Mah Nà...doo doo doo-doo doo, also burrows its way into his brain. Both go in through his ears. Piero, alone, trapped in the darkened darkness of parts unknown, guitarless except for burning guitar that has, and continues to, both warm his coldness and lighten the darkened darkness of darkest parts unknown, vanless of all types of vans, including the broken VW-type, previously mentioned, now has a song. 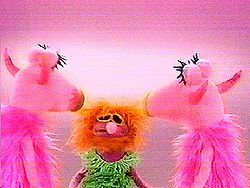 Piero Umiliani, shown during his performance on The Muppet Show in 1976, a mere eight years after being visited by the muse. Notice how he continues to be made of felt. Piero, vanless of the van that he once had, a broken VW van, previously mentioned, guitarless of even the most burnable kind of guitar, the steel kind, his parts, unspecified, warmed, slowly makes his way back to civilization on foot. With him follows a song, untitled, with a "hook", Mah Nà Mah Nà...doo doo doo-doo doo. As he walks, on foot due to his lack of a broken VW van, previously mentioned, the "hook" to the song, the formerly untitled Mah Nà Mah Nà, becomes a chorus. A chorus timed to the beat of his feet, twitchy and stumbling due to his lack of coordination. Left-right left-right...left right left-right left, (pause) Left-right left-right...left right left-right left. This chorus, over the miles of his walking, morphs; changing to what it was before, but repeated, for the most part. A new bit eventually gets in line at the end. "The end" being a figurative term that signifies the middle of a loop. A loop that never ends. Mah Nà Mah Nà...doo doo doo-doo doo, Mah Nà Mah Nà...doo doo doo doo, Mah Nà Mah Nà...doo doo doo-doo doo, doo-doo doo, doo-doo doo, doo-doo doo doo doo - doo doo dooooooo doo. "Mah-Nàmah-nàmah-nàmah Nàmah Nà Nà Nee, ne-Neeliuh Nuh - Màh-Nà Nuh Nuh, Nuh Nà Nà Nà - Eeueieiei... Euei... euh..." embarrassed by his inability to add significantly to the magic of the song, he halts, embarrassed. The "hook", however, continues. He tries again, "Mah Nà Mah Nà-Nà Nà. Mah-Nà-Mah Nà Mah Nà-Nà Nà. Mah-Nà MahNe Nuh-nuh, Nuuh-ne-Nuuuuuh... Nuuuh... Nuh? ", and halts, again, embarrassed, also again. Again, the "hook" continues. Never one to give up, except for that time he gave up, he tries one more time, "Neenee neenee nuh nuh, nuhnuh nuh, uhhh-hee-uhh uh he uh, eehh-nuh-ehh nuh-he-uhheeuhh, uh... muh...? ", and, as before, halts, again, embarrassed, also again. Again, the "hook" continues, again. Mah Nà Mah Nà...doo doo doo-doo doo, Mah Nà Mah Nà ...doo doo doo doo, Mah Nà Mah Nà ...doo doo doo-doo doo, doo-doo doo, doo-doo doo, doo-doo doo doo doo - doo doo dooooooo doo. ^ Mah Nà Mah Nà...doo doo doo-doo doo. This article was nominated to become a featured article; however, due to several votes being devoured by a Flayer, it didn't make the cut (7/11). Don't let this happen again! For just pennies a day, you can prevent another travesty of this nature, or vote for other articles at Uncyclopedia:VFH. This page was last edited on 30 August 2012, at 07:22.